The Lyons Sandstone of Leonardian age crops out along the east side of the Colorado Front Range. During the Permian, a broad sea intermittently covered an area of low relief, where sediments, including the Lyons, were deposited in environments ranging from fluvial to normal marine to hypersaline. To the west, the Lyons lies conformably on the Fountain Formation of Pennsylvanian age, and to the east the red beds of the Lyons thin, become finer grained and pinch out into a siltstone, shale, and evaporitic facies. The evaporites were accumulated in two major subbasins present in the Permian. The Alliance Basin to the north and the Sterling Basin (Lee and Bethke, 1994). 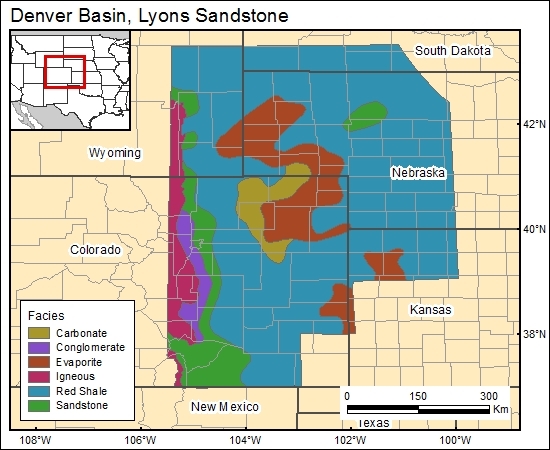 The Lyons Sandstone formed as a nearshore deposit, showing evidence of both shore and eolian processes, and was deposited along a band between the emergent ancestral Rocky Mountains and the evaporite basins, as is shown in the lithofacies map prepared for the GIS data base.